Pinterest is a "visual discovery tool" that was originally created for people to share ideas and inspiration for various interests and projects. The social media site was founded by Ben Silbermann (a former Google employee), Evan Sharp, and Paul Sciarra, and launched in March 2010 as a closed beta. 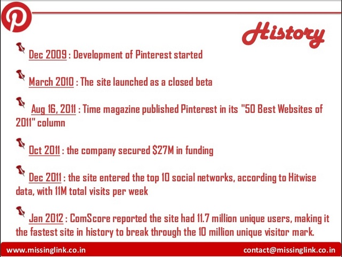 Nine months after the launch, Pinterest had 10,000 users. By the next year, the platform had made Time magazine's list of best websites, and in early January, Pinterest started breaking records. Of course, Pinterest isn't as big as Facebook or Twitter, but the network is also barely four years old. With its active user base, rapid growth, and unique presentation, the site can be a powerful marketing tool if it's used correctly.